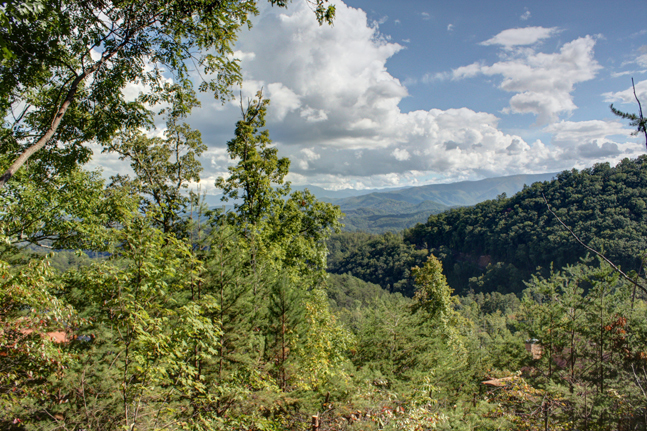 A View for Two’ Pigeon Forge Cabin is a Great Place to Start the New Year! Your significant other won’t be the only thing to take your breath away with a stay in A View for Two! This one bedroom cabin offers breathtaking views of the Great Smoky Mountains and the cabin itself is something to see – from the tree lined staircase to the the stone lined jacuzzi and shower, no detail was spared in this Gatlinburg area cabin rental’s design! Whether you are planning a honeymoon or romantic weekend away with your loved one, A View for Two’s setting high in the mountains will set a romantic atmosphere for you to relax and unwind this winter. Kick off the New Year with some quality time together in a serene Smoky Mountain setting and soak in good conversations and incredible mountain views. The lower level features a pool table and large flat screen TV with a PlayStation 3 for some friendly competition. You will also enjoy the fully equipped kitchen and inviting electric fireplace on this level. Prepare a delicious meal for two together and then curl up by the roaring fire for dessert and coffee! The warmth of this space will make you feel right at home and oh so comfortable for a lovely getaway! Finally, the dual shower built for two is a marvel of impressive stone work. This luxurious experience invites you to settle in and steam your worries away! The deck on this level provides an additional place to gather for quality time and relaxation! Take a dip in the hot tub or cuddle up on the porch swing to soak in the views during the day or gaze at the stars on a cold winter evening. Make your way up the tree-lined staircase, to the second level, which not only offers a comfortable king size bedroom covered with the most luxurious linens, but also a whirlpool tub encased in gorgeous stone work. Additionally, you will find peace while taking in the wonders of the nature around you from the second floor porch. Spend your mornings rocking with a cup of coffee or tea in hand with the one you love most by your side! You will be in awe of the cozy atmosphere this Pigeon Forge cabin exudes! A View for Two is the cabin retreat you have been looking for with its impressive modern amenities, a convenient location and unmatched interior design! Visit our website or call us at (855) 359-1507 to reserve this Gatlinburg cabin rental today and start the New Year off right!